Cybernetics are a very important part of Appleseed. 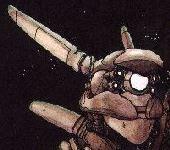 Shirow's worlds are full of human-machine interfaces. It appears that in the world of Appleseed, humanity and technology have meshed almost seemlessly--in fact, it is a constant theme in his works. Therefore, it is very easy to find cybernetic implants in the developed world, particularly Olympus and Poseidon. Below are some examples of available implants and full-body replacements. 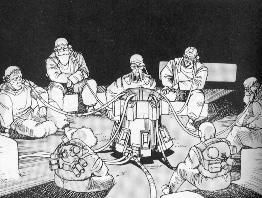 While Shirow's work is full of cybernetics, he actually spends very little time explaining them. For example, Briareos has a regular Bat-belt of gear packed into him, but we often don't know it exists until it pops up at an opportune time. So, the cybernetics listed below are a combination of my best guess from Shirow's work and imports from other gaming systems. It is a very basic list. I recommend that you find other sources, such as the game Cyberpunk and it's myriad of sourcebooks, to fill in the gaps. As always, which cybernetics are available are up to the GM. Design notes: I've been working on the idea of a D6 Appleseed game for a number of years. One of the things that always stopped me in my tracks was developing a decent system for using cybernetcs and armor in a D6 game. Honestly, they never worked very will in the old Star Wars game. Likewise, in other gaming systems, cybernetics add layer upon layer of new rules, making character creation a very lengthy process. Finally, they always have the potential of imbalancing the game (every try to play a purely human Solo in Cyberpunk while surrounded by borged-out comarades?). I'm mainly concerned with keeping the system easy to use. So, that means some of the "realism" of the cybernetics will go right out the window. This may seem at odds with Shirow's worlds, in which he takes great pains to explain the logic behind his creations and to keep them firmly based in reality (in fact, that's one of my favorite things about his work). However, one thing is clear in Shirow's Appleseed: cybernetics do not turn their bearer into a superman. It is abundantly clear that cyborgs can be taken down with relative ease by "normal" characters with the proper skills and equipment. That is the spirit in which I have developed cybernetics for this game. Finally, this is a work in progress. I will change it as I playtest. I invite you guys to do the same, and to let me know what changes you make. If someone has implemented a better system, let me know. Cybernetics are most often implanted because the person has suffered a sufficiently grievous injury that replacement is necessary. With modern medical advances, it is often possible to regrow lost body parts. However, cloning cells requires a great deal of time and expense is often not available to most people. Cybernetics offer a relatively affordable option. Cybernetics are just machines. This means that they suffer the same defects and weaknesses as other high-performance machinery. They suffer from structural stress, long-term use, clogging from dirt, bad wiring, and malfunctions. Most cybernetics require constant maintenance. A fair estimate is that they require about 1-5% of their original cost in upkeep each month (GM's discretion). Obviously, this adds up over time. Most people with many implants sign up for long-term maitenance contracts to keep prices down. Game notes: One option for a GM who has characters with implants is to say that the implant goes inoperative when the character Complicates while using that particular implant. The implant will not work until Jury-rigged or repaired. When a person loses a limb and cannot have it cloned and regrown, they will often get the limb replaced with a cybernetic prosthetic. In spite of general misconceptions, most prosthetic limbs are relatively fragile things that do not grant the bearer super strength or other powers. Because they are usually made with a combination of bio-mechanical, ceramic, and electronic parts, they can be damaged nearly as easily as someone's real arm. When a person is fitted with a cybernetic limb they must also "built-up" in other ways. You can't just attach a chunk of metal to someone's shoulder--it would rip right out. So, a lattice work of supports are also implanted throughout the torso to provide additional support. Cybernetic arms come in a wide variety of shapes, sizes, and quality. They may sometimes have other devices implanted in them (each arm is considered to have 2 "slots" for additions). Strength Value: serves as the Strength Attribute when this arm is used. Dexterity: Approximating the fine motor skills of the human body is not easy. Many of the cheaper cybernetics out there make no such attempt. But the higher level ones equal and even surpass human abilities. The Dexterity value applies not only to Dex-based skills but to all Attribute and Skill checks that require fine motor skills, such as Mechanics, Electronics, First Aid and Craftsmanship, that are attempted with the prosthetic. Armor Value: This is the layer of protection that surrounds the cybernetic unit. This is treated as normal armor and is cumulative with other armor worn over it. Durability: Represents the amount of damage the prosthetic can take before it will cease to function. Cost: initial cost to buy the arm and have it surgically attached at the rating. All costs are cumulative (Thus an arm with a Strength of 1D and Sensitivity of -3D will cost 6000 dollars). Maintenance: cost to keep the arm functioning that must be spent each month. For each month that passes without maintenance, there is a cumulative 1 in 6 chance that the arm will malfunction when used. Thus, after 2 months, there is a 2 in 6 chance, etc. Cybernetic legs are almost always installed in pairs. It is difficult to balance a person with only one articifial leg. If this is the case, the character suffers -1D to all Dexterity rolls that rely upon movement. The legs may sometimes have other devices implanted in them (each arm is considered to have 2 "slots" for additions). Strength Value: serves as the Strength Attribute when this leg is used. Jumping Bonus: This is added to any jumping rolls that are made. Dexterity: Approximating the fine motor skills of the human body is not easy. Many of the cheaper cybernetics out there make no such attempt. But the higher level ones equal and even surpass human abilities. The Dexterity value applies not only to Dex-based skills but to all Attribute and Skill checks that require good balance, such as Stealth and Perform: Dance. Cost: initial cost to buy the arm and have it surgically attached at the rating. All costs are cumulative (Thus an leg with a Strength of 1D and Dexterity of 3D will cost 15,000 dollars). Maintenance: cost to keep the arm functioning that must be spent each month. For each month that passes without maintenance, there is a cumulative 1 in 6 chance that the leg will malfunction when used. Thus, after 2 months, there is a 2 in 6 chance, etc. To whip up cybernetics quickly, see the One-Stop Shopping Chart. A standard implant will replace one of the eyes of the person undergoing the procedure. It will provide the cyborg with standard human vision and have 2 "slots" in which other options may be fit. A Broad Spectrum option allows the cyborg to see in visual ranges beyond what the standard human eye can see. This includes seeing Ultraviolet light, which provides a kind of vision in dark, outdoor conditions. It also increases the bearer's ability to distinguish between colors, allowing him to discern between different objects more easily. The bearer gets a Boost in all Seach and Tracking rolls that depend upon visual cues. Light Amp permits the user to adjust light levels at will. This allows him to see in very minimal amounts of available light. The optic will also quickly compensate for flashes of bright light, giving the bearer +2D to Resistance rolls when attempt to avoid strobe or flash effects that would otherwise render him blinded. With Magnification, the bearer can adjust his lens to either see very small objects (as if using a microscope) or to magnify objects in the distance (as if using a pair of binoculars). At standard cost, the optic will magnify small objects by 50x and far away objects by 10x. The purchaser can seek better optics that will double these values, but at three times the cost. The camera option permits the bearer to use his eye as a kind of video and still camera. The information recorded may be broadcast to another location via a tiny internal modem (note that such transmission can usually be detected and easily traced). The quality depends on the cost of the optic. At 5000, it's pretty much equivalent to a standard hand-held video camer. At 15,000 you have professional news quality. At 100,000 you can shoot Citizen Kane II with it. A linked optic can display information transmitted from a computer via an internal modem or direct link (which is untraceable). This is useful to get a Heads-Up Display of data, maps, and other important pieces of information. With this option, the bearer can link a specially prepared weapon (add 10% to the weapon's cost) directly to his eye. This grants a Boost to all shots with that weapon. Furthermore, with a round of aiming, the bearer gets an additional +1D to hit (in addition to the normal +1, so +2 all together). The standard audal implant provides the bearer with normal human hearing (perhaps a bit better) and the ability to increase or decrease volumes at will. This gives the bearer a +1D to Search and Tracking rolls that depend on sound. A standard implant has 2 "slots" for additional options. The standard communications link acts like a phone or two-way radio receiver (but not a transmitter). As such, it is easily intercepted and traced. A secure link will cost about 10,000 dollars (Difficult Communications rolls to hack it) and fills an additional slot. A small vocal transmitter can be implanted for an additional 5000 credits (this is not considered to take up on of the "slots" on the character). This upgrade gives the bearer hearing that far exceed normal human ranges. It more closely resembles that of a dog. The bearer can turn this on and off at will (otherwise he'd be barking whenever a siren was turned on). The bearer gets +2D to Searching and Tracking rolls that depend upon sound. With this addition, the character can use the implant to scan all unprotected cellular and radio waves. This includes a kind of "cyborg-emergency" channel that all cyborgs (apparently) tune into. Note that most cellular transmissions are protected by some level of encryption and the bearer of this implant cannot hack those without additional equipment. The QT must be linked to a personal computer on the person's body. When it is, it will quickly translate any known human language. Note that the translater is not fullproof and in its haste it may mistranslate some words (a fun little twist for the sadistic GM). But, the listener will get at least the gist of the conversation. The Decrypter option permits the bearer to upload any signals intercepted or directly heard into a companion computer and attempt to break the code. For the Base cost, this will act as Security skill of 3D for breaking codes only. For each additional Die, add 5,000 x the new value. Note that this is cumulative. So a 5D decrypter will cost 10,000 (based) + 20,000 (level 4), + 25,000 (level 5). The Decrypter cannot exceed 6D. The time required to break the encryption depends upon the complexity of the code (GM's discretion). With an implanted recorder, the bearer can download any information that is intercepted or overheard to a memory package kept on the body (or to which the information is transmitted). The bearer can record 4 hours before having to upload the information. The recorder's memory can also have music (or other audio) uploaded into it and played back at the wearer's will. Aside from the peg-legs and hand-hooks of old sea captains, artifical organs are probably humanity's oldest form of cybernetics. Despite the war, they have come a long way since the 20th century. For game purposes, assume that any standard human organ may be replaced with an equivalent artificial counterpart. Those implants will be fairly expensive, but will not require great amounts of maintenace. Furthermore, they do not bestow additional abilities on the bearer. The implants below are those rare items with do increase the bearer's abilities. The IFS attempts to protect the bearer from any harmful substances in the air. It acts as a very advanced gas mask and is always operational. Normal toxic gasses and airborn allergens will have no effect on the bearer. However, new toxins that have not been identified by the IFS's creators may get though the filtration system. In these cases, the bearer has +2D on Resistance rolls against the "new" toxin. This is actually a series of implants which serve to increase the response time and sensitivity of the bearer's nerves. This results in slightly increased reaction time and hand-eye coordination. This grants a Boost to all Dexterity-based skills and and the character acts as if his initiative were 1 die higher. Like the IFS, the EFS serves to keep toxins out of the body. With the advances of biological and toxicological warefare, the danger of airborn weapons has increased signficantly. The EFS is not perfect, but can be the difference between life and death. It gives the bearer +2D to resist all airborn toxins that act through absorption through the skin. Life the other FS's, BFS sifts through the bearer's blood and removes harmful elements that it can recognizes. This gives the bearer +2D to resist diseases and drugs that work in the bloodstream (this includes alcohol). The BFS must be "recharged" every month for a cost of 5000 dollars. Cost: 20,000 x new Strength level. Muscle lacing is a technique in which the surgeon's implant a series of biological and artificial materials that support and enhance the bearer's strength. The technique is still being developed and is not fullproof, but it can provide some significant increases. The costs are cumulative (thus a character going from a natural Strength of 2D to 5D must pay 3Dx20,00 +4Dx20,000+5Dx20,000 = 240,000 dollars! However, the lacing is not noticeable with most detectors, unless a close medical exam is done. The Lacing has an upkeep of 100 dollars per month. If the character's muscles are severely damage by other means (gunshot wounds, for example), the Lacing will have to be repaired or replaced (GM's discretion). Finally, the biological materials will disintigrate over time, meaning the entire system must be rebuilt after 5 years. Lacing cannot be used to upgrade prosthetic limbs. With a brain box, the bearer's brain is complete protected from physical damage. It is wrapped up in an extremely strong layer of metals and ceramics that will resist bullets, heat, cold and even a lack of oxygen (internal tanks will supply up to 1 hour of oxygen necessary to keep the brain alive). This is a good thing if the rest of the bearer's body is destroyed. There are a wide variety of ways for people to interface with computers and other technology. The most standard are listed below. This interface unit permits the user to plug his nervous system directly into a computer. It allows for instaneous transfer of information from the brain to the computer (and visa versa). The bearer is still limited by the bounds of human abilities however. It increases the speed of all Computer Op/Prog rolls by 50% (a character can do 2 such actions in a round without penalty). It also provides a +1D and a Boost to all such rolls. It also permits completely secure transactions between the person and the computer. Finally, multiple bearers may connect to one another through some kind of server-CPU to instantly share thoughts (as the High Council does). Note that Brain Plugs are not very common, even in Olympus. This is probably because standard user-interfaces have advanced so far. It is a fairly invasive procedure and there needs to be a $50/month upkeep. Full-body replacements are pretty rare in developed countries, even Olympus (which probably has the highest per capita Full Borg population). They only occur when the victim has suffered such grievous harm that his body is destroyed and full replacement is the only way he will survive. Even then, he must have friends in high places (or a large personal fortune) to pay for the replacement. If the Borg is being built at Character Creation, see that section for appropriate rules. Later in the game, rather than build a full 'borg from scratch (putting together each componant), consult the table below and choose the desired value and record the appropriate cost. Remember to note the monthly maintenance cost! Next, the standard full borg will have 2 standard optic implants, 2 standard audal implants, a brain plug, a brain box, and all the various filtration systems. For an additional investment, the Borg can purchase install up to 8 optical implants and 8 audal implants. GM's may decide to permit fewer or more slots as appropriate. If this takes too long, consult the One-Stop Shopping Catelog below. Strength Value: This replaces the character's former Strength attribute completely. This value always starts at 1D. Sensitivity: Approximating the fine motor skills of the human body is not easy. Many of the cheaper cybernetics out there make no such attempt. But the higher level ones equal and even surpass human abilities. The Sensitivity modifier applies to all Attribute and Skill checks that require fine motor skills, such as Mechanics, Electronics, Craftsmanship and even Martial Arts, that are attempted with the prosthetic. Jump Bonus: This is added to any jumping rolls that are made. Armor Value: This is the protective value of the 'Borg's outer shell. It may be layered with additional armor. This costs 1% of the orginal cost to repair each point which is damage. Base HP: This replaces the former hit points that the character had. Roll Strength + Constitution (or Resistance) as normal to add additional HP's. Adding up the value of various companants can be cumbersome, especially for GM's trying to come up with 'Borgs on the fly. The table below are intended to facilitate your cyborg-shopping spree. The Implant Packages assume that the character has chosen 2 standard implants and fully outfitted them with options.